Hydrogen peroxide and rubbing alcohol are both disinfectants and commonly used for house hold cleansing purposes. 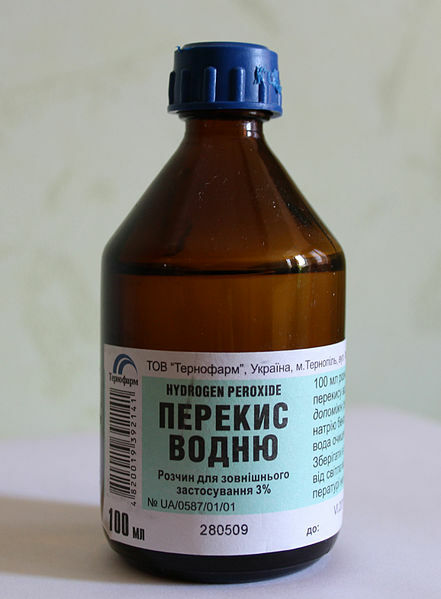 Hydrogen peroxide is a compound formed by the combination of oxygen and hydrogen whereas rubbing alcohol is a very poisonous form of ethyl alcohol or simply put alcohol. Both are placed in the same kit and practically used for same purposes but they are very different chemically and have very different properties. Hydrogen peroxide is the simplest form of peroxide and it is chemically represented as H2O2. Rubbing alcohol is isopropyl alcohol, and is also called as isopropanol or ethyl alcohol. Hydrogen peroxide as described by certain scientists as ‘oxygenated water’ due to presence of an additional atom of oxygen to water, is more often used as a cleansing agent. Hydrogen peroxide is used as a fuel additive which is used as propellant in jets, rockets and also submarines. Hydrogen peroxide is the strongest species of oxygen compounds found on earth and thus used to propel rockets and jets. As a bleaching agent it is used to dye wool and hair blonde. As a cleaning agent, it is used for washing electronic components. It is also used by dentists for certain procedures as teeth whitening, mouth washing and cleaning, and bleaching of teeth. Hydrogen peroxide is also used for cleansing of water and water entering power plants. It is powerful in controlling sulphur as an adulterating agent. It is used in micro etching in PCB manufacturing industries. The only drawback of hydrogen peroxide is that it retards healing properties even if it is used in minute quantities. Rubbing alcohol has strong disinfectant properties. Rubbing alcohol is the result of addition of ingredients in isopropyl alcohol which does not change the chemical properties but only makes it more poisonous and cannot be used for consumption. From the very name of rubbing alcohol, we can guess its usage is extensive in rubbing, massages and for medical rub downs. It was earlier used in many cases for rubbing over the forehead and body during fevers as it would evaporate from the skin and lower the body temperature. Rubbing alcohol being a very powerful disinfectant is used to cleanse the skin before giving injections, cleanse medical and surgical instruments and remove germs from minor wounds. Rubbing alcohol is an inflammable product and if not handled with care it will catch fire, whereas hydrogen peroxide is not inflammable. The fizzing effect of peroxide makes it more readily usable for cleaning wounds but rubbing alcohol is stronger at curbing bacteria, fungi and other infecting agents. Rubbing alcohol is more safely utilizable for disinfecting hands before surgical procedures and surgical dressings and hence, rightly called as ‘surgical spirit’. Rubbing alcohol is volatile but peroxide is not. Rubbing alcohol cleanses electronic instruments much better as the alcohol vaporizes post cleaning, leaving the instruments clean and shiny. Hydrogen peroxide is chemically H2O2 or oxygenated water. Rubbing alcohol is ethyl alcohol with some additives. Rubbing alcohol and peroxide both are fulminant if not used judiciously and hence, even though they are household cleansing agents they need to be used within limits. Peroxide is more harmful if it comes in contact with hands whereas rubbing alcohol is much safer for cleansing hands. rachita. "Difference between hydrogen peroxide and rubbing alcohol." DifferenceBetween.net. February 19, 2014 < http://www.differencebetween.net/science/chemistry-science/difference-between-hydrogen-peroxide-and-rubbing-alcohol/ >. “inflammable” means that a substance (rubbing alcohol) will NOT burn. “Not inflammable” is really a double negative, and means (though badly stated) that the substance IS combustible!! You are wrong James. Inflammable and flammable mean exactly the same thing; that an object is easily set on fire. So, not inflammable(or flammable) means just the opposite. Flammable means it can be set on fire like wood. Inflammable means if the temperature temperature gets too hot, it will spontaneously combust like gasoline. Incorrect. Ethyl alcohol is NOT the same as isopropyl alcohol. Different compounds, not even isomers. If writer means ethyl alcohol is also (sometimes) used as a rubbing alcohol, as is the more commonly used isopropanol, then fair enough. Ethyl alcohol is also called ethanol, but never isopropanol.